I've been trying to print on Verbatim Digital Vinyl CD-Rs but I can't get the print to align properly. I realize I have to adjust the top and left margins in addition to the disc inner and outer diameter. The disc dimensions are 70mm and 23 mm. the default setting for my Epson printer are top: 8.5 mm, left: 16 mm, outer diam: 118 mm and inner diam: 23 mm. Using basic math, I come up with a top margin of 56.5 and a left margin of 64 mm. This doesn't work, the print isn't properly aligned. Can you please give me the correct dimensions? 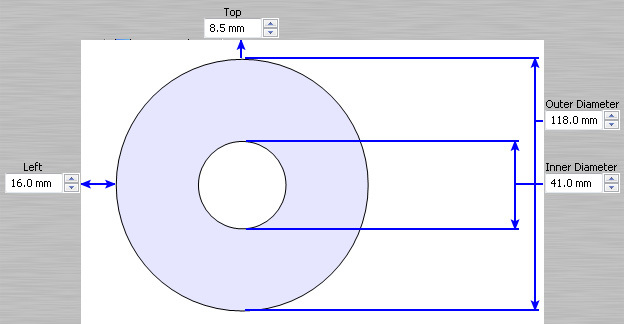 Part of the problem in getting the correct dimensions is that the Left and Top dimensions are based on the edge of the disc rather than the center point. In the next version of AudioLabel, the disc templates will be based on the center point, which will make it a lot easier to adjust the print alignment. Please let us know if this works out for you.